My friend Susan Hertzler is a great mom, great teacher, great cook and a great Christian friend. She and her husband John have two precious adopted, elementary-age boys and a beautiful freshman daughter. Since my girls are out of the house and in Texas, I tend not to cook as much. Susan, on the other hand, is always cooking and being creative. I asked her to "guest blog" and share some of her newest yummy recipes. Like many, Susan got an "Insta-Pot" for Christmas. She has been trying all kind of new recipes. 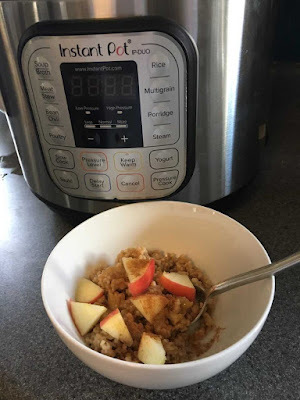 She found this recipe for Instant Pot Apple Pie Oatmeal over at The Cookie Rookie. They loved it! She is planning to try it again soon with blueberries or a different fruit. Susan said... the best part is that the oatmeal has some texture... not "mushy"! Set your pressure cooker to saute and add butter. Allow butter to melt, spreading across the bottom of the instant pot. Add in the oats and stir to coat in the butter, Stir continuously 2 minutes or until the oats are starting to toast. Pour in the water, cider, brown sugar, cinnamon and apple. Stir to combine. Switch instant pot to "pressure cook" and set for 8 minutes. When it is done cooking, allow to sit closed for 5 minutes, naturally releasing some of the steam. Then press the release and allow the rest of the steam to release. Very carefully, open the pot. Stir to freshen up the yummy smelling oatmeal. Serve hot - topped with whipped cream, nuts, diced apple, etc. Enjoy!